How Many Servings are in Juice Plus+? There is no proper way to establish any equivalence between fresh fruits/vegetables and the JP+ capsules. The fresh produce we use is uniquely processed and dried, which removes solids, water, and many volatile compounds. Although the process preserves as much of the nutrition as possible, there is no way to make a truthful statement that there are no nutrients lost in the process and that the resulting powder is chemically and nutritionally equivalent to the original, whole produce (see the video below). There is a second reason, equally important; we want to avoid even the implication that Juice Plus+ can be substituted for fresh fruits or vegetables. We want people eating more of the ‘real thing’ and, interestingly, that’s exactly what happens when people ‘eat’ Juice Plus+ over an extended period of time (see our Children’s Health Study Results). The only thing fully equivalent to a serving of fruit or vegetable is a full serving of fruit or vegetable. That’s why Juice Plus+ is “The Next Best Thing to Fruits and Vegetables”. Finally it is important to emphasize that the value of Juice Plus+ is not derived from any equivalence. The real value is in the benefits that accrue from taking the capsules consistently. The clinical research clearly shows significant improvements such as increases in many antioxidants and decreases in oxidation compounds like homocysteine and lipid peroxides. 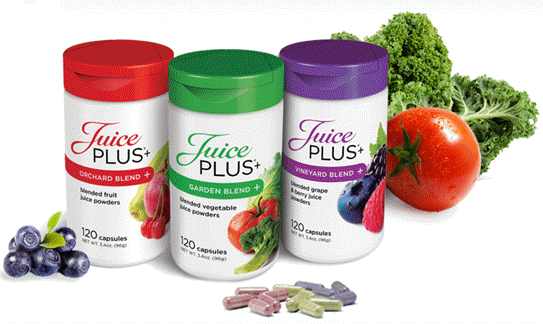 It is important to emphasize that Juice Plus+ is not a formulated multivitamin, it is basically a gently processed fruit and vegetable food product; if you look at other fruit or vegetable products (raisins, nuts, applesauce, fruit juices etc) you will find that food products carry only one or two nutrient results on the label. 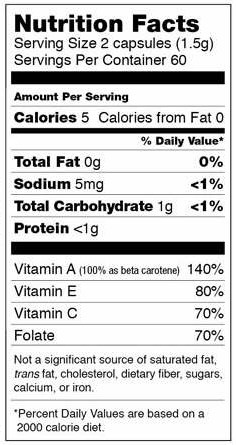 Most often the nutrients declared on the label are those which are present at 2% or more of the daily value (DV). There are four nutrients listed on the labels of Juice Plus+ capsules. 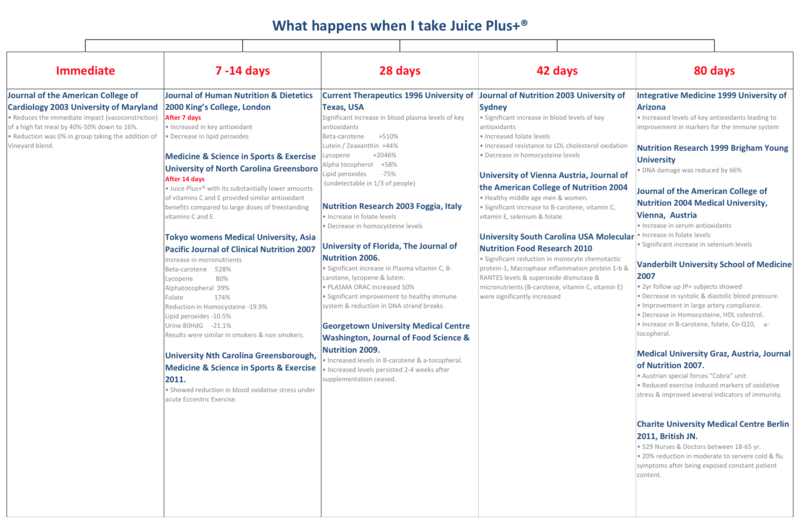 In the clinical study at the University of Texas MD Anderson Cancer Center, Houston, TX (publishing in the March 2012 issue of the Gynecologic Oncology Journal), Juice Plus+ and Juice Plus+ Complete helped bridge the gap between what is consumed and what is needed by everyone, but especially by those women with ovarian cancer. This does give some interesting perspective. If you were to juice, say, a carrot, and let the water evaporate you would have a small amount of powder left. This shows that the powder in those capsules comes from a pretty significant amount of fruit, vegetables or berries/grapes – but we will ‘never’ say exactly how much!